Buying a new walking cane can seem like a fairly simple proposition. After all, it is a pretty basic walking aid. Then, you look online and find that there are many options out there. And, they’re all designed for different needs and preferences. When choosing the best walking canes for men, there are a number of features that you should look for. It is important to buy a cane that will last and give you the extra support many men need. When you are shopping for a cane, you will notice that many of them are designed specifically for men or women. There are a number of reasons for this. And, being aware of these reasons are very helpful when buying your own cane. First and foremost, men’s canes are often heavier and stronger. This is to compensate for the fact that men are often larger and heavier than women and require more support. The handles of men’s canes are also often thicker. This is because men usually have larger hands and need this extra surface area for a comfortable hold. Men with slight frames, or small hands, may be able to use a woman’s cane if they like a particular design or color. A second example of gender differences in canes are the design features. Women’s canes are often made to be highly decorative as well as functional. This is reflected in the colors, materials, designs, and patterns available in canes for women. It is not at all uncommon to see floral prints and wild patterns. Walking canes for men tend to less decorative and in more basic, solid colors. However, many men’s canes supplement their designs with decorative handles and tips. So, they, too, are often designed to be attractive as well as functional. Your gender is no real barrier to getting a cane that looks good and works well at the same time. There are plenty of cool walking canes for men out there. It is also important to know the differences between walking canes and walking sticks. You can check out that post here if you want more details. This is probably the essential part of your cane. Unfortunately, people who are new to walking with canes will probably overlook the importance of this feature. The handle of your cane is the part in contact with your body constantly. And, your hand will press down on it every time you take a step. An uncomfortable handle hurts your hand, gives you blisters or sore areas, or even makes you reluctant to use the support at all. Choosing a handle design that works for you is an extremely individual decision. The best handle depends on your own physical condition, how much weight you will put on the cane, and even your hand and skin strength and resiliency. Your cane handle should be large enough to spread the impact while still allowing you to easily grip the surface. It should also keep your hand in a neutral position, without any unnecessary or painful positioning of fingers. Derby Handle – This type of handle features an open-ended design that is created to allow for easy gripping. It also has a hook on one end so it can hang over the arm or off a coat rack. Fritz Handle -This is a wide handle that is good for people with arthritis. The handle is open-ended like that of the Derby design. Palm-grip Handle – Designed specifically to conform to the palm of your hand, this type may offer more support and ease of use. The Palm-grip handle comes in both right and left-hand design, so make sure you order for your dominant hand. Offset Handle – If you find a normal handle painful then this might be a good option. This handle is padded for comfort and comes in a variety of styles and designs. Cane handles are made from a variety of materials including wood, plastic, and leather. The most important feature of the material is its comfort. Your hand should not slip and the handle shouldn’t cause pain or be chafing to the palm. If it does, send it back or choose another cane. If you find most canes painful to use, choose a padded material for extra comfort and support. People who use canes usually do so because they have difficulty walking due to illness or weakness in certain parts of their bodies. These types of physical limitations often make slipping or falls a major concern. The tip of your cane does a lot towards stabilizing your movements. Cane tips can be made of many substances including wood or plastic, but a rubber tip is probably the safest option available. Rubber tips will help the cane grip on the floor and will help prevent the cane from skidding or slipping out from under your weight. Even if your cane doesn’t have a rubber tip when you buy it, you can buy one separately if this is a concern for you. Canes come with weight limits. Depending on the material or construction of your new cane, it will have a recommended upper limit. It’s important that you know the limit before you buy a new cane. Your cane has to support all of your weight. If it isn’t strong enough then it could break while you’re in mid-step. That would be very dangerous. The weight limits of a cane are usually shown on the product ad. It is really important that larger men check this first because many canes have weight limits of only 250 lbs. The weight of the user should be under the weight limit of the cane with several pounds to spare. Height limits on canes make sure that you are getting the support you need and also for your comfort. Don’t let your new mobility device cause more problems than it solves. Buying a cane that’s the right height for your body can avoid injuries, strain and bad posture. This is especially important for men, who tend to be taller than women. Ask a friend, family member or caregiver to measure from your wrist joint to the floor when you are standing straight. This measurement is the best cane height for you. Many canes are available that have adjustments for different heights, but there are also plenty of canes for tall people on the market (see below). These adjustments are usually pretty simple to make and do not require any tools. Most canes adjust by little steel push pins that pop in and out of alignment holes. Make sure the cane you buy has these adjustments. So, based on the discussion above, here are my recommended walking canes for men. Some of these, of course, are based on my own style opinions but there are a lot of options out there to choose from. Because these aren’t your basic type of cane, it is important to know these may not be covered under Medicare benefits. 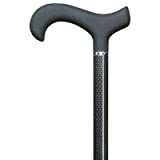 For those who like a simple but elegant look, this Carbon Fiber cane from Harvy is worth considering. It is ultra lightweight but strong because of its carbon fiber construction. Includes soft touch Derby handle for a comfortable ergonomic fit. The cane ships out at 37″ long but can be trimmed to fit with a hacksaw. Just pop off the rubber tip, cut to fit, and put the tip back on. Watch the weight limit though – this cane only holds 250 lbs. Images, Ratings, & Prices from Amazon Product Advertising API - Updated on 2019-04-19 at 23:14 - contains affiliate links (see footer). This walking cane from Harvy is made extra long for taller men – men who are over 6 feet to 6’7″ tall. It also has the benefit of folding up for easy carrying and storage when not in use. Elegant wood Derby styled handle with a simple black shaft. It is also available in standard heights too at Amazon. This cane from Drive Medical has most of my recommended criteria for men’s walking cane. It is adjustable in height for a proper fit. Also, it is strong and durable with a 500 lb weight capacity. For easy storage and travel, it even folds up into 4 pieces! It will be a bit heavier than some other canes, but that is what makes it more durable and able to support the larger man. Images, Ratings, & Prices from Amazon Product Advertising API - Updated on 2019-04-19 at 23:45 - contains affiliate links (see footer). For some reason, this walking cane screams southern gentleman to me. I can just imagine a colonel sitting on his porch drinking a mint julep with this cane to his side. This cane though is all about style with only basic support. The knob handle is not the best for arthritic hands. But, this is a cool looking cane for a man who just needs a little help with balance while walking and wants to look good using it. In terms of stylish walking canes, this is the best option. Images, Ratings, & Prices from Amazon Product Advertising API - Updated on 2019-04-20 at 03:18 - contains affiliate links (see footer). There are a ton of wooden cane options to choose from. Preference here is generally based on personal style. Here are some of my favorite wooden canes for men based on style and design. Images, Ratings, & Prices from Amazon Product Advertising API - Updated on 2019-04-20 at 00:15 - contains affiliate links (see footer). After you’ve chosen your new, ideal walking cane, you may be wondering how to keep it in tip top condition for continued use over the next few years. Wood walking canes require some special care and tending to, so keep these tips in mind. The most important part of ensuring your wood cane’s durability is to thoroughly dry it off after every use out in the rain or other wet conditions. You’ll also want to make sure not to store your cane in direct sunlight, or near any source of heat (next to a stove or oven, etc.). In terms of cleaning and polishing, the technique and materials depend on the type of wood you have in your cane. If your cane has a varnish finish, polish it only occasionally with a neutral color shoe polish. If it’s unvarnished, just clean it off with a damp cloth every so often. However, if your cane is made out of ebony, rosewood, or any other dark wood, you’ll want to find a shoe polish that is similar in color, and polish it when it needs a touch up. Just remember that a little bit of shoe polish goes a long way, so don’t use too much at once. For the handles, they’ll also need special care and cleaning. If the handle is made out of silver. which is fairly popular, you can clean it with a nice, gentle silver cleaner. If it has a rubber coating or other type of soft grip handle, you may need special cleaners, but usually a gentle soap and water will do the trick. 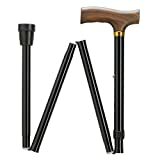 When thinking about durability, another great way to ensure a long life for your cane is replacing any worn parts at the very first sign or damage or wear. Choosing a cane that meets your physical needs and looks good is more complicated than you might think. Choosing the wrong design can mean painful injuries to your hand, arm or shoulder, or could even cause falls. So, take your time when you’re choosing a cane, thinking first of functionality and secondly about the design. 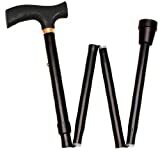 The best walking canes for men are comfortable to use and also meets the physical needs and limitations. Most are also available in a design that suits you and your lifestyle. There are even canes with built-in lights for men who are out after dark. Tell me about your experience shopping for a men’s cane. Do you have any recommendations or advice? Your comments and questions are welcome below. And if you found this guide helpful, please share on your favorite social networks for family and friends to enjoy! Walkers for Small Adults: Smaller Walkers for Short Adults That Fit So Much Better! What is a Knee Walker and When Do You Need One? The article on “attractive” canes/walking sticks is a very good one. However, with the population aging, more thought needs to be given to those who are “in between” the walking stick and the 4 wheeled walker. It has been a journey of encouragement and positivity to convince my husband to use the “walking stick”. He has been doing so for the last three years. Now his condition has deteriorated to the point that he needs a walker. He needs it for balance and to decrease instances of falling. The 4 wheeled walker is totally wrong for him. He cannot handle “brakes”, which makes it a dangerous choice for him. We have a “standard” two wheeled walker which he is now using. I have ordered larger wheels (5″), ski feet for the back legs and a pouch to carry his phone, a bottle of water, and his wallet. While it SHOULD do the job, it is not something that someone would “feel good at all” about having to use. Maybe there should be a “choice of colors” (red, blue and black) in addition to the plain metal and plastic which is now available. Maybe they should have “matching” accessories such as plain colors for men and more decorative choices for women. Many people like the walking sticks available today. Many like the 4-wheeled and try-wheeled walkers. I don’t think ANYONE likes the standard two wheel walker. What do we have to do to get manufacturers to improve the look and attractiveness of the two wheeled walker? Thanks much. Again great article. Hi Mary – thanks for such a well thought out comment. This is an issue we fight with at the home medical company I work for. Unfortunately, insurance companies are driving this process right now, particularly Medicare. The majority of walkers sold in the US are paid for by Medicare for their beneficiaries. Because their allowance for a walker is so low ($37 to $50 depending on where you live), medical equipment companies can’t afford to buy anything but the silver and plastic models you describe. So, this is the style that the manufacturers make the most. But, I do see a change taking place. Thanks to the internet, more and more people are choosing to buy their own medical equipment and supplies. The more this happens, the more choices manufacturers will make. You may have seen this with the four wheel walker rollators. Those now come in all kinds of designs. But, unfortunately, two wheel folding walkers are still commodity type items. I hope that changes in the future also!